abime.net is copyright 2001-2019 by Astruc Pierre, also known as RCK. Readers may not modify, publish, transmit or in any way exploit any of the contents of this site, in whole or in part, without the express prior permission of the copyright holder. Direct comments to the appropriate person. All rights reserved. which supports the RapaGUI plugin (AmigaOS3, AmigaOS4, MorphOS and AROS!). QEMU (Quick EMUlator) it is a software that allows you to emulate systems x86, AMD64, PowerPC, MIPS e ARM. GUI security/bug fixes, dmabufs support for GTK/Spice. HstWB Installer is a set of powershell scripts, image templates, configuration files, AmigaDOS scripts and binaries used to easily build Amiga HDF or directory images with automated installation of Workbench, Kickstarts roms and packages with additional content for Classic Amiga. It's currently being developed and maintained by Henrik Nørfjand Stengaard. Setting up a blank Amiga HDF image with e.g. PFS3, Workbench, Kickstarts roms, WHDLoad games and demos installed properly can be a cumbersome task unless you spend a lot of time figuring out how this is done step by step. This is where HstWB Installer come to aid and can help to automate such installations using WinUAE and should be possible for almost anyone to do with very little knowledge about Amiga. The packages included are BetterWB, HstWB, EAB WHDLoad games and demos menus for both AGA and OCS. Menu packages has screenshots and details for EAB games and demos WHDLoad packs configured for Arcade Game Selector 2 and iGame. 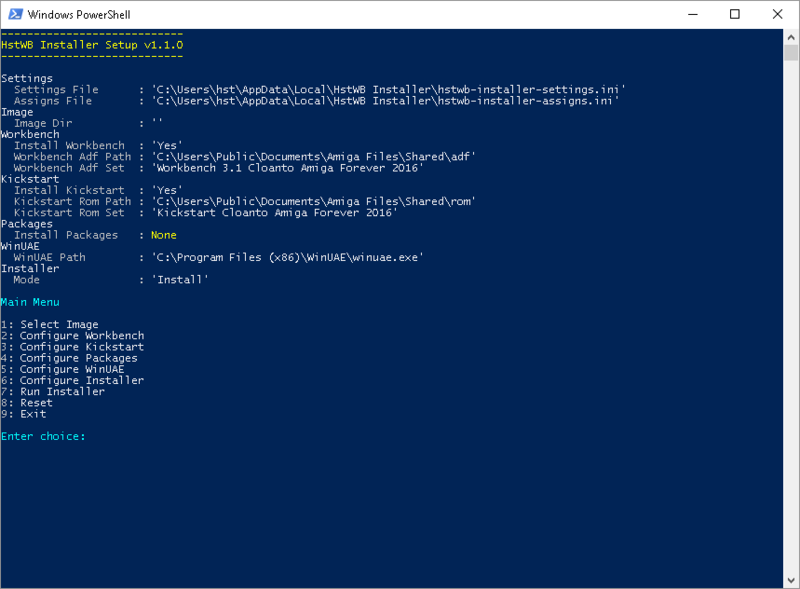 These packages can be added to an image configuration and will be installed during HstWB Installer installation process. In general HstWB Installer is build as a minimalistic as possible using BetterWB and HstWB to support A500 as a minimum. HstWB is mainly targeted A500, A600, A1200. The minimalistic approach allows users to customize it further with their own preferences like installing eg. MagicWB or Scalos. 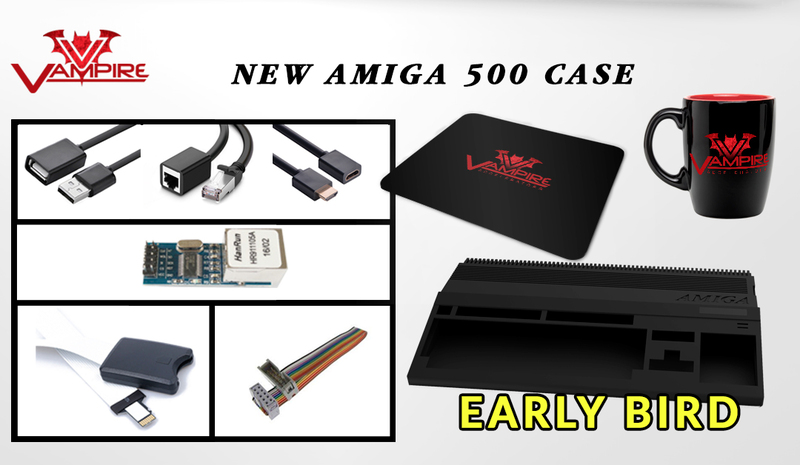 Since Amiga Workbench and Kickstart roms are licensed property these files can't be included as they need to be acquired legally by buying Cloanto Amiga Forever or using grabkick from aminet to dump roms from real Amiga's. HstWB is short for my name and Workbench (very original, I know). For all those who have a RASPBERRY, watch this video.With the 3D printer has built custom boxes and also the cover of the best videogames and not only. From the link you can also download the pre-configured Retropie 4.3.3 iso without rom. I think I'll buy it too. Daniele Tartaglia an Italian genius. 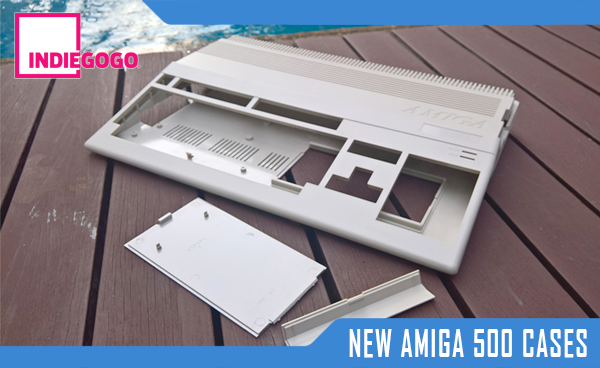 The Mini Miga is an Amiga 1200 inspired by the NES and SNES Minis. The Kickstarter will launch in the next few weeks. LoadModule installs so called "resident modules" in a reset-proof way, possibly replacing ROM modules by disk-based modules, similar to what SetPatch and its "ROM-Updates" mechanism does. "Resident modules" are loadable binaries containing a special structure telling the Os how to initialize them and what to perform on initialization - Amiga libraries and devices are the canonical example of these modules, the "ram-handler" is another. "LoadModule" can be used to install these resident modules in a reset proof way such that they are available immediately at system bootstrap time. This is desired whenever a module is required for booting, as for example some of modules in the Amiga-Os ROM-Updates. "LoadModule" can therefore be used as a more canonical form of the ROM-Updates since it does not require an undocumented file format - modules have to be provided as loadable disk based binaries in their most canonical form, and can be kept in their canonical location. For example, the V45 "console.device" could be kept in DEVS: similar to all other devices. "LoadModule" can be used as well to replace the ROM-based icon and workbench.libraries by their disk-based 3.5 and 3.9 replacments, or to make modules reset-proof that are typically disk-based, for example the diskfont.library or the mmu.library. Can also load the 3.9 exec.library, and can upgrade the ROM fully automatically from disk. See below for details. For a quick start, just run "ExtractModule" without any arguments on an Os 3.9 system. This will place all modules of the ROM Updates in the right places, and LoadModule AUTOwill pick them up correctly. Amiga Game Music HQ Studio Remaster. Grab this free album of Amiga Game Music HQ Studio Remaster by Naviára at her Bandcamp page; Naviára Please consider to donate her some money even if this album is totally free. Turrican II - Title Music. R-Type - Theme From R-Type. Legend of Faerghail - Title Music. Shadow of the beast - Ingame Music. Castle Master - Title Music. Quoting from the website "The MorphOS development team is proud to announce the immediate availability of MorphOS 3.10, which represents one of the biggest updates in its history yet."